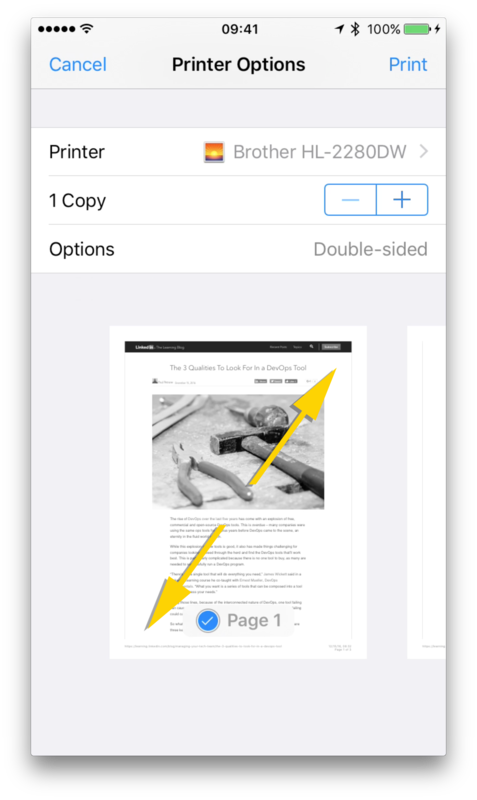 Occasionally, you may want to share a document, webpage or other content from your iPhone or iPad as a PDF. The advantage of the PDF format is that it allows you to present documents in their original appearance and layout, without the need to include separate image files, fonts or other related assets. 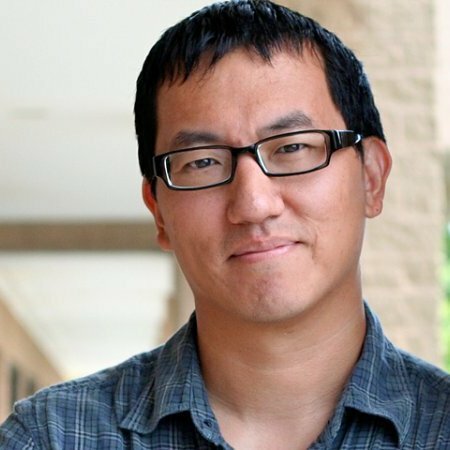 And, although there are several third-party apps available for iOS that can generate PDFs, iOS itself also includes the ability to create PDFs from any app on your device that has the ability to print. 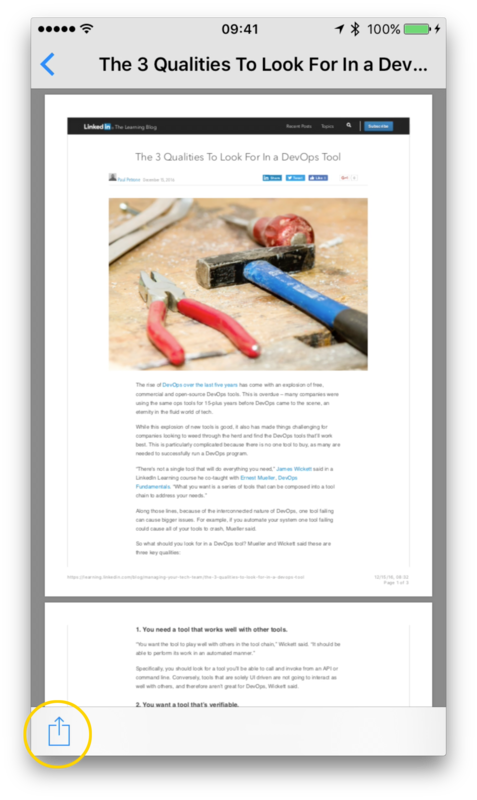 To share a webpage as a PDF, tap the “Share” button. 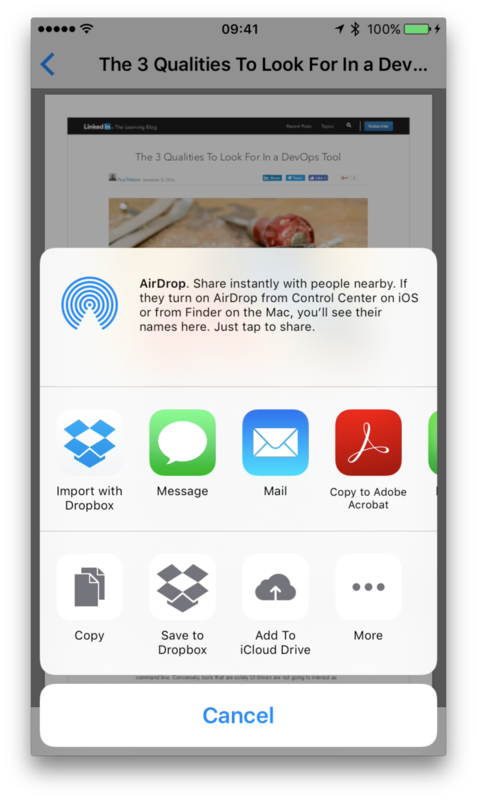 That opens the standard iOS sharesheet, containing the sharing options available on your device. What you see in the top row depends on the apps you have installed, but we’re interested in the bottom row here. Swipe across the bottom row to locate and tap the “Print” option. This is where you would normally search for an AirPrint-enabled printer on your network if you wanted to print to paper. But, in this case, we want to generate a PDF. To do so, place two fingers on the preview of the page that appears in the bottom half of the screen and pinch out. That gives you a full-screen preview, and at this point we’re actually looking at a PDF. So now the trick is to save it like this. Tap the “Share” button found on this screen. Again, you can choose any of the options available here. For example, if you have Dropbox installed, you can save this PDF to your Dropbox account. If you have Adobe Acrobat installed, you can open it in Acrobat. Whichever option you choose here, the file you’re saving or opening will be a PDF. For example, tap “Mail”, and a new email message will open in the Mail app with the PDF already attached. Just fill out the “To” and “Subject” fields, and you can send it off. 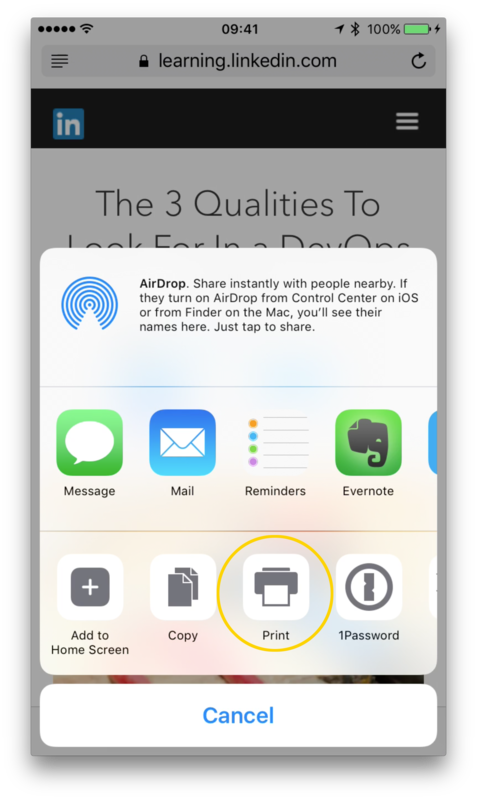 Again, this works in any app in iOS that includes the ability to Print. 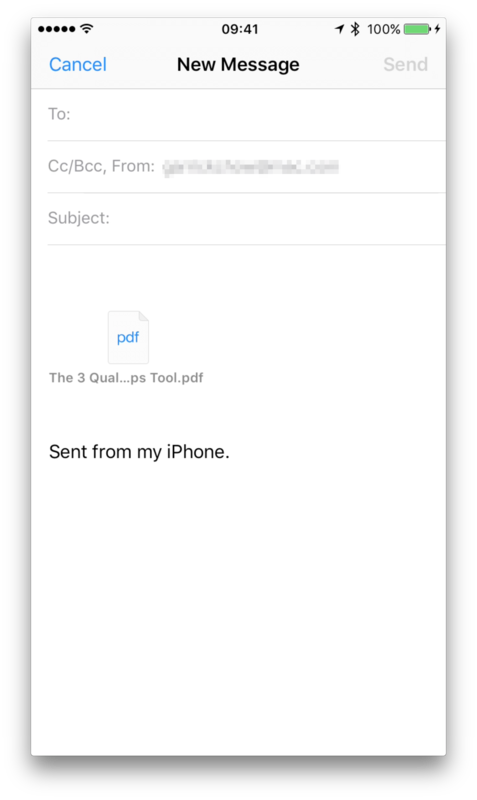 So the next time you need to share a document from your iPhone or iPad, and you want to make sure it looks to your recipient exactly the way it looks on your own screen, use these steps to save it as a PDF, and send it off on its way. For more quick and useful tips, be sure to check out Monday Productivity Pointers at LinkedIn Learning. 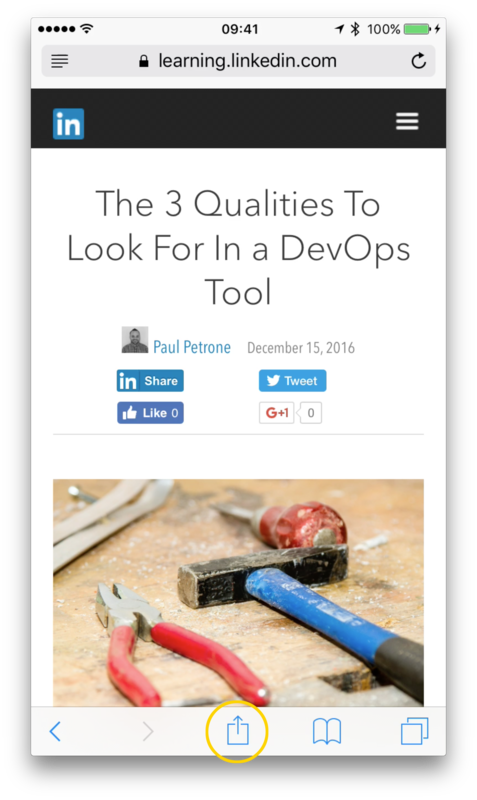 New tips are published every Monday. Good News: You Can Now Collaborate in Real Time With Office 2016 for Mac. Here's How.